It's the dead of winter. I think I need a little bit of color to brighten things up around here. Don't you agree? Here's something I swatched ages ago and forgot to post and now seems like the perfect time to post it. It's the Kryolan Aquacolor Day Glow Effects palette! 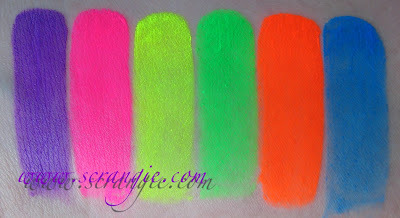 It comes with six UV-Day Glow (blacklight reactive) shades: UV Violet, UV Pink, UV Yellow, UV Green, UV Orange and UV Blue. Aquacolors are not normal powder shadows or cream shadows. They're like a watercolor paint. A wet brush is needed to apply them. UV Purple, UV Pink, UV Yellow, UV Green, UV Orange and UV Blue. One important thing to note about these. These are intended to to be used as special effects makeup, such as face painting or for theater use. They contain neon pigments which are not FDA approved for eye use. The Kryolan website and the palette's packaging do not state that these aren't eye-safe, and I've been told that neon pigment is approved for eye use in other countries, so I'd strongly recommend doing a bit of research before deciding whether or not to use these on your eyes. One reason I've heard for why neons aren't eye-safe is that the particles are large and rough and could potentially scratch the cornea. Another reason I've seen repeated is that neon pigments or dyes (pinks especially) can be irritating or cause allergic reactions. That said, these aren't the easiest colors to apply, but once in a while they're really fun. When I use them, I usually set them with their corresponding UV Day Glow Powders. 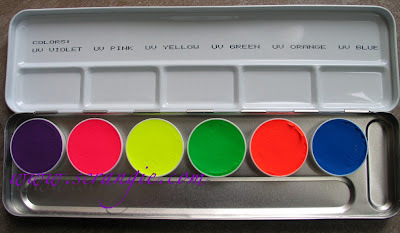 That's how I used these when I did my neon green Halloween eyes. I also try to use them over a white or creamy opaque base to give them a little more opacity. oh my god amazing neon! must. hunt. them. down! OMG, the orange one is cutting through my eyes... I think I'm blind. Love the purple and pink though. WOAH those are NEON! I would have no idea how to wear them! Hope you're doing well, Scrangie! Thats very cool. Definitely the right day for this (its super foggy and cold where I am. 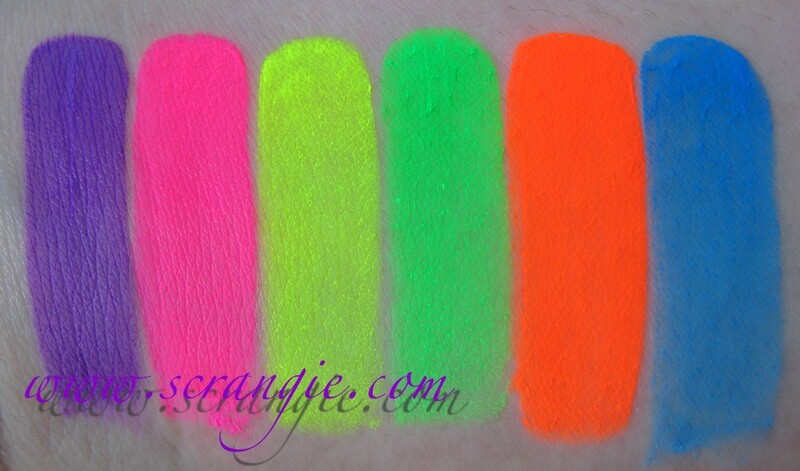 I love neon anything, especially cosmetics. Do some eyes with them! Dang! Thanks for the free radiation therapy! I can imagine the amazing looks you could do. Scrangie, have you ever experimented with using these powders on your nails? I've seen folks use MAC pigments (and others that I can't name on the spot) both to mix single-use frankens and to apply with a dry brush over/into wet polish. Have always wondered about Kryolan, as it seems so saturated.